Staff to take on new roles following promotion - Pygott & Crone - Houses. Homes. Harmony. 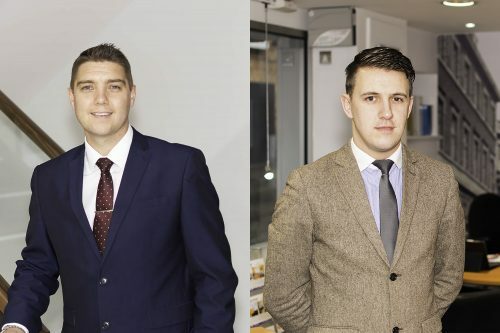 Pygott & Crone are proud to announce that two long serving members of its residential sales staff will be taking up new positions within the company this week. Craig Stones will be returning to our flagship Lincoln Silver Street office to manage our expanding specialist New Homes Department. Craig joined Pygott & Crone’s Lincoln team in 2005 as a Residential Valuer before being promoted to Branch Manager of Grantham in 2012. Craig will be dealing with all aspects of the new homes market in Lincoln and surrounding areas, from plot acquisition for clients through to the promotion and sale of homes on new developments. Our second promotion is for Ryan McGuinness who will take over Craig’s role of Branch Manager at the Grantham Office. Ryan joined Pygott & Crone in Lincoln in 2012 and quickly became the company’s top Sales Negotiator for successive years. Ryan was rewarded for his hard work and dedication with a promotion to Grantham Residential Valuer in August 2016 and will now head up the team at our Watergate branch.